Celebrating the Champions – Valentino’s Angel MI. The Senior Female Champion and Best in Show at July’s Emerald Trophy, an International B Show, was the glorious mare, Valentino’s Angel MI, a horse that has won titles on three continents – no small feat given that she is just five years of age. 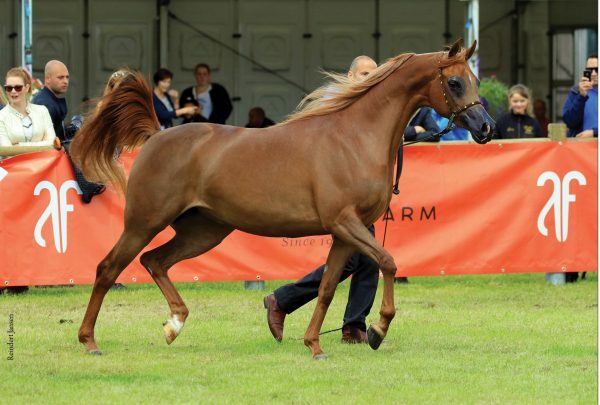 Valentino’s Angel MI was bred in Australia by Mulawa Arabian Stud, and this beautiful chestnut mare is owned by HH Prince Abdullah bin Fahad Al Saud’s Al Mohamadia Stud in the Kingdom of Saudi Arabia. She was spotted by the farm’s Manager, Bruce McCrea, when he visited Sydney. Shown in Australia as a yearling, Valentino’s Angel MI became only the second filly in Australian history to be undefeated in her debut season. She took class wins and championship titles at the National Stud Show, the East Coast Championships and the Australian National Championships. Bruce then spotted this enchanting filly, and she was purchased by Al Mohamadia Stud who, incidentally, also has another from Mulawa Arabian Stud, the multiple-champion colt Prussia MI (ex Parada by Magnum Forty Four out of Presence) and sired by Al Mohamadia’s chief stud, Abha Qatar (Marwan Al Shaqab x ZT Ludjkalba by Ludjin El Jamaal). Valentino’s Angel MI made her debut for the farm as a two-year-old at the 2013 All Nations’ Cup in Aachen, winning her filly section and taking the Bronze Junior Female Championship. 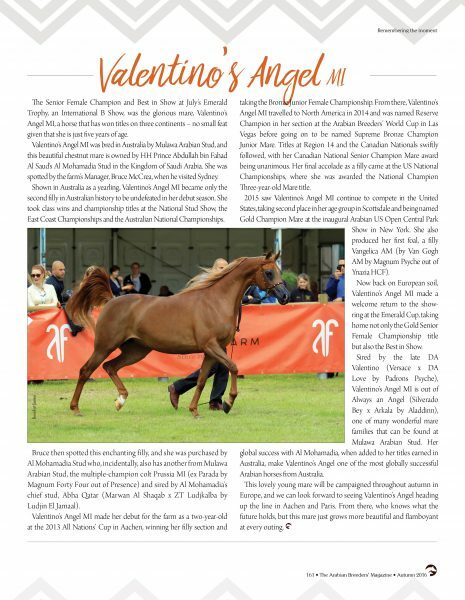 From there, Valentino’s Angel MI travelled to North America in 2014 and was named Reserve Champion in her section at the Arabian Breeders’ World Cup in Las Vegas before going on to be named Supreme Bronze Champion Junior Mare. Titles at Region 14 and the Canadian Nationals swiftly followed, with her Canadian National Senior Champion Mare award being unanimous. Her final accolade as a filly came at the US National Championships, where she was awarded the National Champion Three-year-old Mare title. 2015 saw Valentino’s Angel MI continue to compete in the United States, taking second place in her age group in Scottsdale and being named Gold Champion Mare at the inaugural Arabian US Open Central Park Show in New York. She also produced her first foal, a filly Vangelica AM (by Van Gogh AM by Magnum Psyche out of Ynazia HCF). Now back on European soil, Valentino’s Angel MI made a welcome return to the show-ring at the Emerald Cup, taking home not only the Gold Senior Female Championship title but also the Best in Show. Sired by the late DA Valentino (Versace x DA Love by Padrons Psyche), Valentino’s Angel MI is out of Always an Angel (Silverado Bey x Arkala by Aladdinn), one of many wonderful mare families that can be found at Mulawa Arabian Stud. 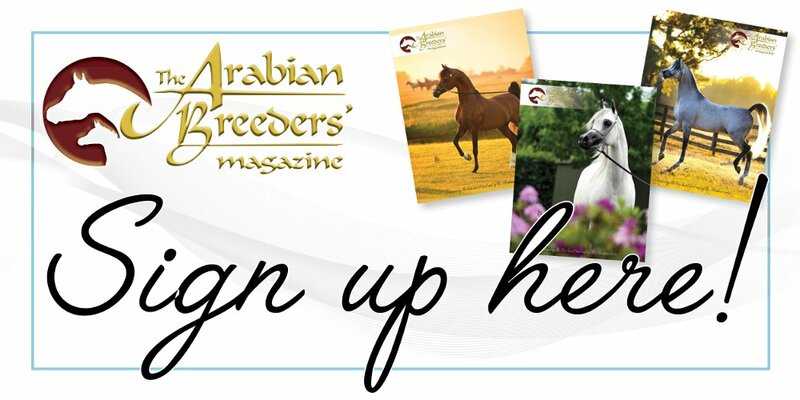 Her global success with Al Mohamadia, when added to her titles earned in Australia, make Valentino’s Angel one of the most globally successful Arabian horses from Australia. This lovely young mare will be campaigned throughout autumn in Europe, and we can look forward to seeing Valentino’s Angel heading up the line in Aachen and Paris. From there, who knows what the future holds, but this mare just grows more beautiful and flamboyant at every outing.